So, something I wanted to do with all of our foods this year was include foods with aphrodisiac qualities - I apologize if you didn't really want to know that about me or us, but it's the truth of how I went about planning this meal. 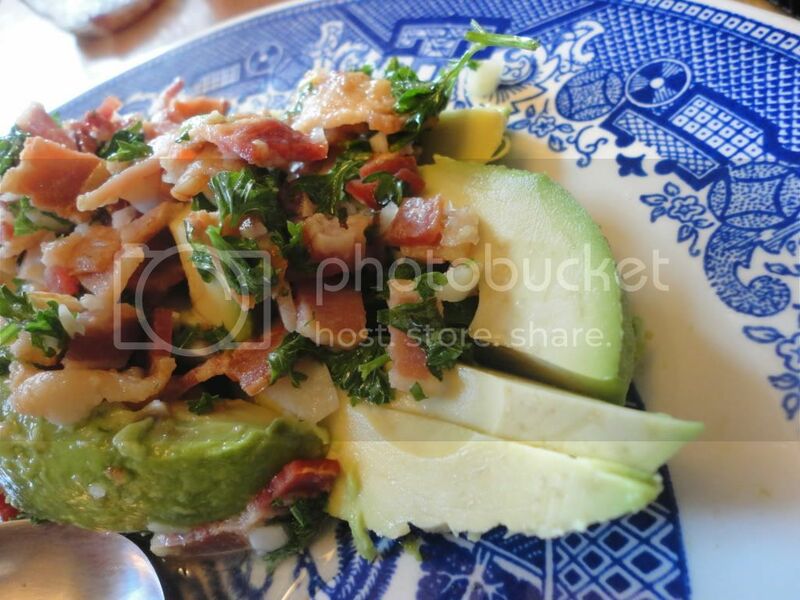 So I conducted some research and discovered loads of great recipes, including this recipe for Avocado Salad with Warm Bacon Dressing. Interestingly enough, we had filled up on all the other dishes of the night and didn't have room for this one one top of stuffed peppers, slices of bread topped with apples and brie, stuffed figs and wrapped asparagus. So, it became the following days lunch. And it was oh-so-delicious. The Avocado salad is easy, just thickly slice an Avocado. For the dressing, you'll need to cook 1/3 lb. Bacon in a large skillet and let cool/drain on paper towels. This isn't the time for soft, chewy bacon, you definitely want it to be a bit crisp. Now, you'll need to save at least 2 Tbsp. of Bacon Fat for the dressing, although, if you just pour it all into a glass jar or tin can, you could save it up and make delicious things like Tortillas...or even cookies, but that's up to you. Heat the bacon grease in a small sauce pan and add 1-3 cloves of minced Garlic (three is REALLY strong, but that's what the original recipe calls for - so adjust as desired), 1/4 cup Water, 2 Tbsp. Lemon Juice (or Homemade Vinegar...or not homemade) and 1 Tbsp. Sugar, simmer until sugar is dissolved. Season with Salt and Pepper and stir in 2 Tbsp. of chopped Parsley. Drizzle over Avocados and ENJOY!